Don’t bother with paper ads, or brochures in doctors offices, the best way to gain clients for your photography business is utilizing social media. Assuming that you’ve set up your photography business, decided What to Charge your future clients, and have taught yourself to Say NO to Auto and now take beautiful pictures, you are ready for the clients to start banging down your door, right? When I started my blog, it was for the sole purpose of sharing sneak peeks to my clients of their session. I’d put 5-7 images up in a blog post, email the clients, then encourage them to email the link out to their friends and family to share. I never really knew how many people shared them, but I’d get occasional comments from grandparents or friends saying how much they enjoyed the images. Kristen said she’d give 50% off of your photo session if you book in the next week saying you are our friends! If you have 5 friends sign up, you’ll get a free 16×20 of your choice. 2 friends=1 8×10. This was an incentive to get them excited to spread the word to their friends, and send the link of the sneak peek to more people. The downside to that is that it is limited by the number of people the client feels like including in their email. Hopefully more because of the incentive, but what would reach even more is what’s next. This was a game changer. I still needed my website as my “home base” but social media is where it’s at to spread the good word of mouth. I’d guess that 95% of the people I know are on Facebook: My grandparents, parents, siblings, almost my kids, my friends from church, school, high school, college, neighborhood, old neighborhood, dance class, soccer, etc. You can give images to your client and ask them if they share online to please link back to your site or Facebook page, but people often are forgetful, or maybe even lazy and they will just plop up an image you took for all to see, without your ame on it. Here are two ways to promote your work on Facebook. 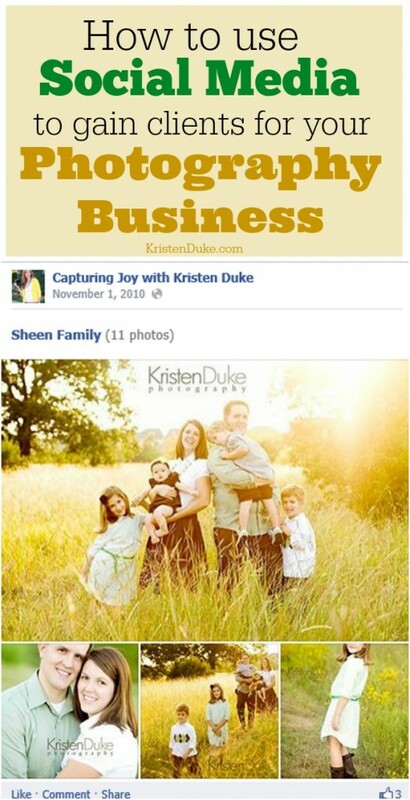 Post one single image from your clients session your Facebook business page. Link back to your site post for their friends to see more images (they just saw that ONE). TAG the client (get permission first) so that way, ALL of their friends and family wlll see this one image, a link to your site, and it is posted from your business facebook page (which may possibly gain you more followers). You must first be facebook “friends” with them before you can TAG them. Ask an engaging question for your readers and the clients friends to answer. The more comments and “likes” on a post, the more that post will be seen by more people, and not get lost in the news feed. Encourage your clients/family to click SHARE so even more people will see your name and image. 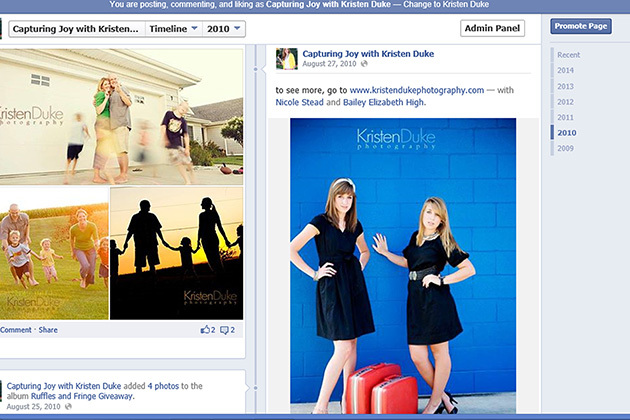 This is an example of two senior girls pictures where I tagged them on my facebook page. I put my home page instead of the direct link because I figured people would click right away (and I didn’t blog as much back then). Now, I’d put the direct link. TAG your client (If it’s a senior, tag them and the parent). You have to first be facebook “friends” with them before. Both are great tactics. Play with each and see which one your prefer. Make sure you have a direct link to your site at the top of your facebook page to make it EASY for future clients to get ahold of you and see your style. Engagement and interaction on Facebook is very important because it means MORE people will see the content you share. For example, I have about 25,000 facebook followers, but on any given day, I can see that generally only 5,000 people will see what I post. With engagement (likes, comments, shares), those numbers who see that particular post, go up. Do random contests or giveaways to help your facebook LIKES go up. You can offer a free session or half off a session. It can be something as silly “The first person who guesses my favorite candy bar gets half off their session fee” or an end of year contest where you post a favorite image from each client session that year, and open it to voting. The winner gets a free session the next time. That way, all of your clients from that year, will rally their friends to vote for them, and at the same time see your “year in review” images. Here is a contest I did in January 2012 for all of my 2011 clients, it was a BUSY year with 70 sessions! Click on that link to see all 70, and to see who won! Look around to see what other photographers outside of your area are doing for contests and engagement. Team up with a local business and cross promote. Maybe you are a newborn photographer and you love the style of a Family photographer, you can help each other out with a similar cross promotion on social media. You can share their stuff, and they can share yours. I used to do this so much more trying to drum up clients a few years ago (back when I was really wanting more clients, now I’m scaling back!) and found it really beneficial. We all know how important “word of mouth” can be, and when we leave it up to just come up in conversation, it just doesn’t happen. Utilizing social media is such a great way to spread the good word about your business. You can do the same thing with twitter and instagram. Want to start your own photography business? Check out the business book I co-wrote!